What is the genesis of the current conflict between Eritrea and Ethiopia? The border dispute between Eritrea and Ethiopia has been continuing ever since Eritrea became independent and the present Ethiopian government came to power. Bilateral attempts to settle the dispute by jointly demarcating the common border had been in process, but these attempts were frustrated when Ethiopia unilaterally issued a new map that included large tracts of Eritrean territory and intensified its incursions into these areas to forcibly incorporate them into its domain. The dispute escalated into armed conflict when unprovoked Ethiopian forces attacked an Eritrean patrol unit deep inside Eritrean territory on May 6, 1998. This attack was the latest in a long string of violations by Ethiopia of Eritrean territory and sovereignty, as well as the understanding between the two countries to maintain the status quo on the border pending a final agreement. In July 1997, Ethiopian troops (two battalion strong) occupied the Adi Murug area of Bada, in eastern Eritrea, dismantled the Eritrean administration there and installed a new Ethiopian administration. A few days later, Ethiopian authorities forcibly evicted Eritrean farmers from villages in the vicinity of Badme in southwestern Eritrea, saying that they had demarcated the area as Ethiopian territory. Eritrea protested to the Ethiopian government asking it to reverse those infringements, but the Ethiopian authorities who had created new facts on the ground refused to heed Eritrea's call. These incursions continued, resulting in Ethiopian occupation of large tracts of land, especially in southwestern Eritrea. Why did Eritrea not respond publicly to the earlier incursions of Ethiopia into Eritrean territory? Eritrea had not been fixated on the issue of its border with Ethiopia. Firstly, Eritrea's border with Ethiopia is among the most clearly defined of colonial boundaries and Eritrea was confident that it can easily be demarcated through peaceful and legal means on the basis of the treaties that established it. Secondly, in light of the good relations that existed between the two neighbors and their avowed objective of promoting regional integration, the Eritrean government believed that the issue of borders was of secondary significance and should not thus be allowed to obstruct the development of bilateral and regional cooperation. Consequently, Eritrea consistently worked to resolve the tension arising from border issues quietly, peacefully, and in as much as was possible, bilaterally. It did not go public when Ethiopian troops occupied the Adi Murug area of Bada and forcibly evicted farmers from the Badme area, razing to the ground their dwellings and farms. It did not issue ultimatums or threaten all out war, as the Ethiopian government has now done. It simply called for the formation of a joint commission to resolve the issue on the basis of the treaties that established the border between the two countries during the colonial period. Eritrea's restraint, however, only encouraged the Ethiopian authorities, who might have misinterpreted it for weakness or lack of resolve, to push on with their flagrant violations of Eritrean sovereignty. Has the border between Eritrea and Ethiopia ever been legally delimited? Yes. The border between the two states was delimited in treaties signed and ratified in 1900, 1902 and 1908 by the then Imperial Government of Ethiopia and the Italian colonial government in Eritrea. This border is, in fact, one of the most clearly defined in Africa, and it had functioned as the internationally recognized boundary between the two states during the colonial period and the Federation era. Even after Eritrea was annexed by Ethiopia in 1962, the former boundary served as the border for the provincial administration. Official Ethiopian maps under Emperor Haile Sellassie, and subsequently under the military government of Mengistu Haile-Mariam clearly illustrate this fact. Any map of Eritrea from Italian colonial times to the present, including all those that were produced by the State of Ethiopia and by the United Nations at the time of the Ethio-Eritrean Federation, confirm this internationally established boundary. Were any changes made to this internationally established boundary? No legal alterations have ever been made. 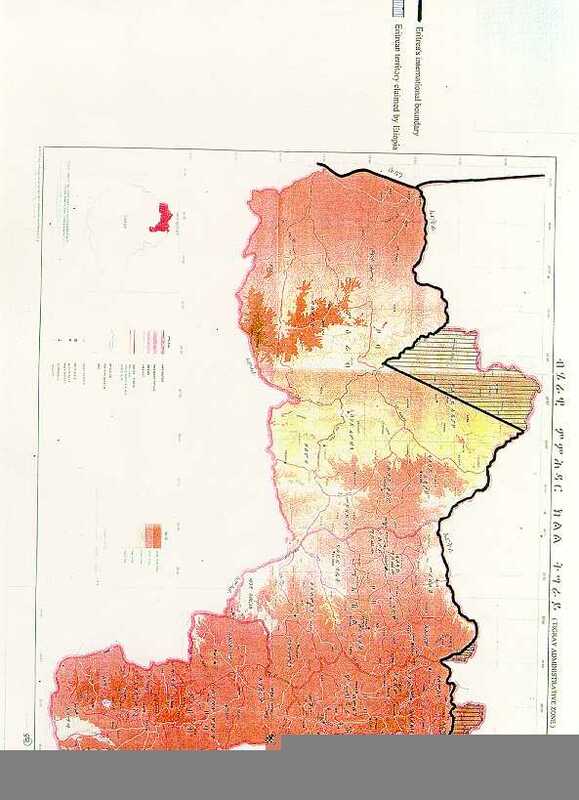 The first alarming sign of an intention on the part of Ethiopia to unilaterally and formally change the established border came in 1997 with the official publication of a map of the Tigray region of Ethiopia. Subsequently, Ethiopia embossed this new change in its new currency notes issued in November 1997 and simultaneously continued to unilaterally demarcate the border so as to coincide with its new illegal map. As any comparative view of this map with any of the earlier ones clearly demonstrate, this new map incorporates large swaths of Eritrean land into Ethiopia (see maps in Appendix). And even today, despite formal claims to respect international boundaries, Ethiopia has not officially rescinded this map. Why did border incidents mushroom into a major conflict, and why has a solution to it become so intractable? Despite Eritrea's efforts to have the border demarcated through a joint border commission, Ethiopian's expansion into and expulsion of Eritreans from Eritrean territory intensified in a bid to occupy all the areas incorporated into the new Tigray map of 1997. When the May 6,1998 Ethiopian attack on an Eritrean patrol unit was repulsed and Eritrean forces drove the invading Ethiopian forces out of Eritrean lands they had encroached upon, the Ethiopian government issued an ultimatum on May 13, 1998 threatening that unless Eritrean troops unconditionally and unilaterally withdraw from the areas Ethiopia claims, it will attack and drive them out by force. This was a declaration of war, and indeed the Ethiopian army attacked Eritrea throughout the common border and bombed the Eritrean capital, Asmara. Thus, Ethiopia escalated its attack in the Badme area to a full blown war against Eritrea. Meanwhile, the Ethiopian government started the mass round-up, incarceration and expulsion of Eritreans and Ethiopians of Eritrean origin resident in Ethiopia. The Ethiopian media also started a frantic inflammatory campaign inciting hatred and confrontation against Eritrea and Eritreans. How has Eritrea responded to this crisis? Commitment to resolve the border dispute through peaceful and legal means, and thus agreement to an immediate and unconditional cessation of hostilities to be followed by a cease-fire. Acceptance of the border established during the colonial period by treaties signed by Ethiopia and Italy, and the demarcation of that border by a neutral technical body on the basis of these treaties. Creation of an enabling situation for peaceful and speedy demarcation of the border which, if need be, would include the demilitarization of the entire border. The deployment of neutral observers to monitor the border areas to ensure peaceful demarcation. What have been the results of the various mediation efforts so far and what is Eritrea's reaction to them? The root cause of the conflict is the non recognition and violation by the present Ethiopian government of the border between Eritrea and Ethiopia established during the colonial period. Eritrea firmly believes that any dispute concerning the border can and should be resolved peacefully and legally and not by recourse to force. Eritrea thus welcomed and cooperated with the mediation efforts of various concerned parties from the outset. With all of them, Eritrea has always maintained that a lasting and just solution needs to be based on legal foundations and investigated facts, and not on political expediency. It is unfortunate that some good intentioned facilitators at the outset did not heed to this cardinal principle and their efforts led to closed doors, a fact exploited by the Ethiopian regime which is always bent on the use of force to usurp what it claims. The Organization of African Unity (O.A.U.) has finally came up with a proposal for a framework agreement for the peaceful resolution of the conflict. The Eritrean government has accepted this proposal as a basis for discussion, and has called for a cessation of hostilities while discussions on the proposal continue to diffuse the tension and create a conducive atmosphere for a peaceful process. This call is supported by the O.A.U. as well, but Ethiopia has rejected this call and is preparing to re-launch an-all-out offensive against Eritrea. What would have to happen to de-escalate tensions and arrive at an enduring settlement of the conflict? Both sides would have to agree to resolve the present crisis through peaceful and legal means, and reject solutions that are imposed by force. Both sides must accept to respect the established colonial boundaries between them and state so publicly. They must further agree that the actual demarcation of the border will be carried out on the basis of the treaties that established it by a mutually acceptable technical team within a clearly defined time-frame. It should be agreed that the demarcation be carried out in the presence of a third party to witness the process and to act as a guarantor of the outcome. Eritrea has publicly committed itself to these principles, while Ethiopia has not done so. Ethiopia continues to demand that Eritrea must unilaterally and unconditionally withdraw from areas Ethiopia claims and that Ethiopia administers these areas as a precondition. If not, it goes to war. Eritrea' s position has been for a quick demarcation of the border on the basis of the principles and measures stated above. The impasse around redeployment and civil administration of the disputed areas seems to be related to how one defines the basis and origins of the conflict; Ethiopia claims it is a question of Eritrean 'aggression' and started on May 6, 1998, and Eritrea asserts that the cause of the conflict is Ethiopia's violation of the established border by unilaterally redrawing it and encroaching on Eritrean territories by force to establish a de facto situation starting from the day it came to power. How can this impasse be overcome? Since there are clear differences on the basis and genesis of the conflict, Eritrea believes that a full investigation of the existing border until the coming of the present Ethiopian regime to power and incidents around the border up to and including that of May 6, 1998 should be conducted by an independent commission. But this can be done in tandem with the demilitarization process and the demarcation of the border so as to definitively settle the dispute and end the conflict. It should not be used as an excuse to further escalate the current conflict and delay demarcation which is the ultimate solution. Does not the indiscriminate expulsion of citizens further exacerbate the conflict and leave a bitter residue in the long-term relations between the two peoples? Yes. This deplorable act can obviously harm the relations between the two peoples. It is important that the international community clearly condemns these criminal acts of 'ethnic cleansing' being perpetrated by the Ethiopian government. In a cynical bid to confuse the international community, Ethiopia claims that Eritrea too is expelling Ethiopian citizens from Eritrea. In fact, in resolutions it passed in June 1998, the Eritrean National Assembly has made it absolutely clear that it condemns such acts and has informed Ethiopians residing in Eritrea of their right to seek legal redress if they are subjected to any form of harassment or illegal act. Eritrea has further made it clear that any individual or organization is welcome to come to Eritrea to witness the status of Ethiopians living there. The facts of the matter are now openly acknowledged by specific United Nations agencies, representatives of the European Union and the International Committee of the Red Cross (ICRC). The O.A.U. has acknowledged that there is no "systematic or official action directed against Ethiopians in Eritrea." Unfortunately, the Ethiopian government has refused to heed the call of the international community to desist from these gross violations of human rights and international law. Anyone seeking independent confirmation of this can contact the United Nations and the Office of the High Commissioner for Human Rights. How is it that, on the one hand both countries call for a peaceful resolution of the conflict, and on the other hand, there is a horrendous prospect of a major protracted war looming over the horizon? Both countries have been expressing their readiness for a peaceful resolution of the conflict and have been appealing to the O.A.U., the U.N., other regional organizations and countries to help facilitate a peaceful resolution. The difference lies in the sincerity and commitment of their pronouncements and actions. Eritrea has been consistently and firmly articulating that there is no alternative to a peaceful solution to the conflict and has been reacting to peace proposals in good faith. The Ethiopian officials, however, have been engaged in double-talk. On the one hand, they say that they want a peaceful settlement of the conflict, and on the other hand they have been putting irrational preconditions, diverting from the main issue of the border dispute and beating war drums unless they have it their way. 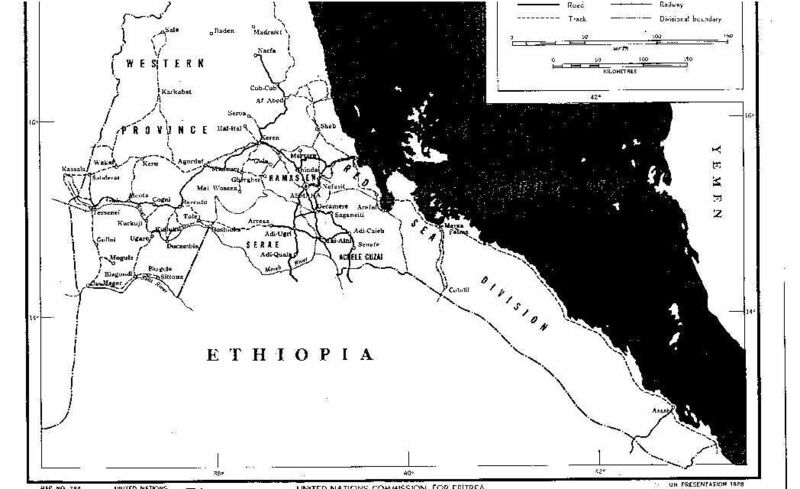 MAP 1 A Map of Eritrea produced in 1907, when Eritrea was a colony of Italy. Please note the straight-line border on (on the southwest border of Eritrea and Ethiopia)this map and compare it with the alterations made by the Ethiopian government in the 1997 Tigray Administration Zone of Ethiopia (MAP 3). This is the Badme line. MAP 2 A Map of Eritrea produced in 1950 by the United nations Commission for Eritrea showing the administrative boundaries of the country. Here again, please note the straight-line border between Eritrea and Ethiopia. MAP 3 This is the 1997 map of the Tigray Administration Zone of Ethiopia. The shaded or lined areas are Eritrean territory claimed by Ethiopia.